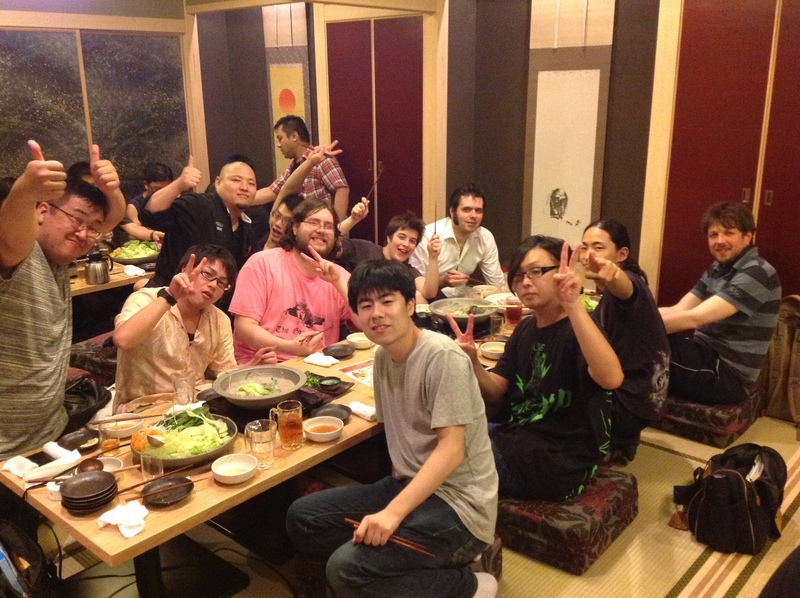 It was good to be back in Japan! Returning to Japan and not being as nervous nor clueless – I really enjoyed myself a lot more this GP. I took care of myself better, communicated more with the Japanese judges and learned more about GP operations. It was an awesome experience despite some embarrassing mistakes from me that I hope many of you can learn from. To put into context for this report: I know how to read most Japanese scripts and am able to understand spoken Japanese to a certain extent. My Japanese speaking is still very poor. Most Japanese players and some Japanese judges can’t speak English very well and might have trouble understanding your spoken English. Don’t make the mistake of thinking that they don’t understand English, however! Most students in Japan spent years and years learning English in school and can be very proficient with the language. However due to pronunciation differences, there might be difficulties in understanding each other’s English. 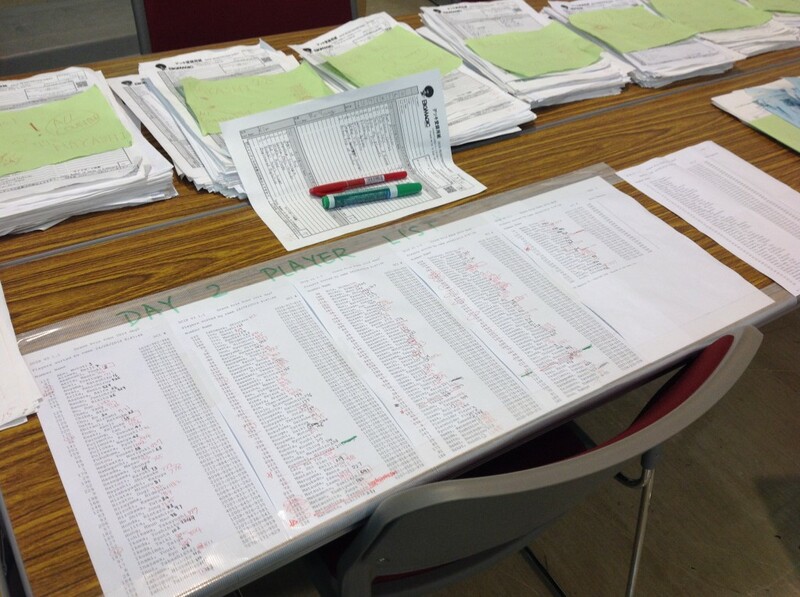 Read more advice and about how I handled my first Japanese GP experience here! 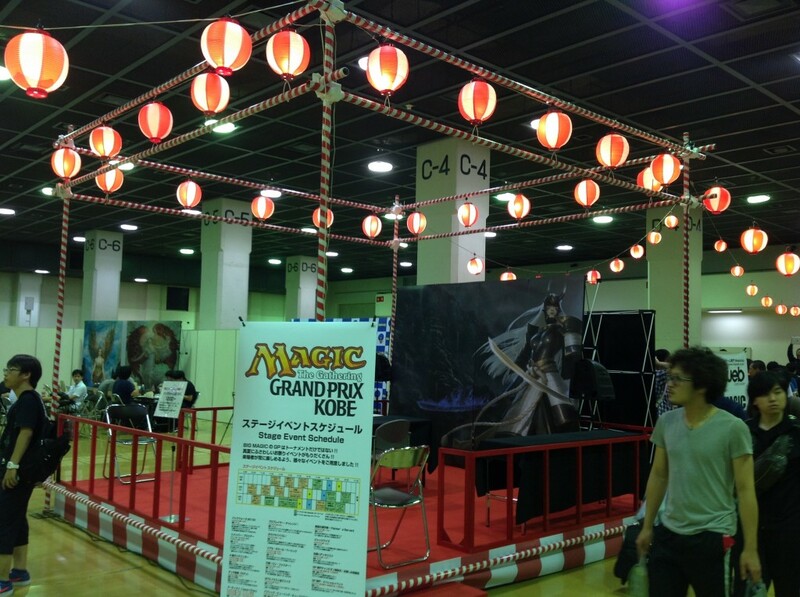 The theme for the GP was “Matsuri”(祭) – a festival. To visualize the theme, on the ground floor, there was festival lanterns everywhere, fun fair games, a festival stage for stage shows, female staff in “Yukata”(Japanese female summer wear), and male staff in “Happi” (Traditional Japanese straight-sleeved coat). On the first floor, it was a more sober setup for the main event. I was very happy to be acquainted with Alex Jerard Muhich (L2, USA) whom I met at the staff hotel lobby over breakfast as we chat and headed to the venue together. Mitsunori Makino (L3, Japan – RC) was Friday lead and he began the day with a briefing and then assigned us roles. I was placed at Deck Checks for last chance trials (having the Japan RC remember you can read Japanese was pretty good for an ego boost,) along with Asuka Nagashima (L2, Japan) and Hiroshi Yamada (L1, Japan) and later on we were joined by Shing Nien Fong (L3, Malaysia) and Yusuke Sumitomo (L1, Japan). Asuka was as friendly and easy to talk to as always and she really made me felt welcomed at the GP. Since we will be checking decks from all the trials, we stayed mainly at ‘HQ’ where teams shared all important information by posting them on the walls and basically checked decks whole day long. As DC lead, Asuka coordinated the checks and we were sent in pairs to check decks from whichever Trial we were told to go to. I was paired with Yamada who’s working on his first GP and we had to give a Marked Cards infraction our very first check. I would have preferred if we confirmed the infraction and delivered the ruling in a shorter time, but taking the time to lead an inexperienced judge was very important too. Taro Itou (L2, Japan) gave us good advice to give the other player some explanation since leaving them hanging is bad customer service since we took too long with the player with the infraction. The very next check we made also had an issue where there were extra cards in the sideboard. We issued a D/DLP with a Game Loss. However, Makino overheard and quickly overturned the ruling and had us rescind the penalty. It turns out that the players were instructed to present their sideboard clearly and then leave their sideboard on the table outside their deckbox during the match and therefore were clearly separated. Lesson learned – recognizing cultural differences, even when it comes to Magic playing is important. 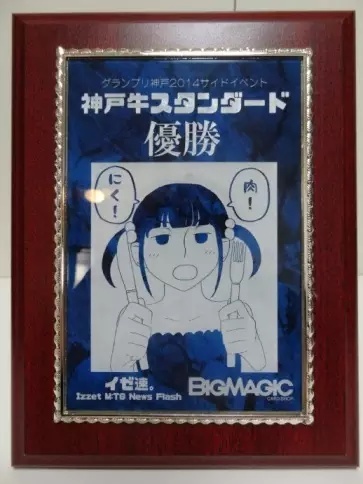 Also, Makino would like all Game Loses to go through him, even though most of the time Tardiness and D/DLPs don’t, so always check with your Team Lead. The rest of the day were pretty routine and we managed to deck check at least 20 over tournaments with just the four of us. (We got Sumitomo middle of the day to reinforce the team, but then later lost Yamada.) Asuka did a good job coordinating the team – we were kept sufficiently busy the entire day but she made sure everyone had breaks and kept telling us not to overwork ourselves. Katsuhisa Kanazawa (L2, Japan) whom I had the chance to work with at Nagoya a few months ago, informed me on Saturday morning that part of my GP Nagoya report was apparently translated and shared amongst Japanese judges and they liked it. That is amazing news to me and I am rather proud of it. 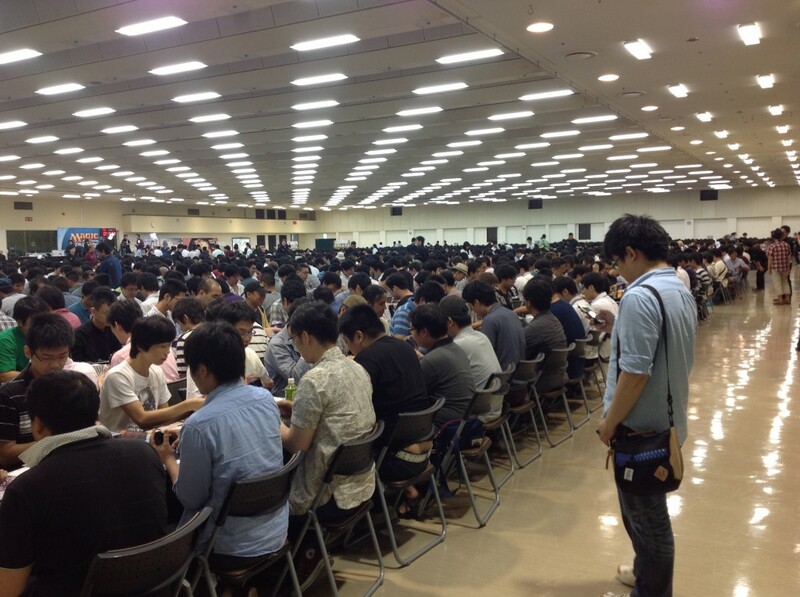 With 2270 players this is the single biggest event I’ve ever been a part of. I’m with Deck Checks again for the main event in Team 2 with Kenji Suzuki (L3, Japan) leading the team along with Itou, Naoki Takahashi (L1, Japan), Yuki Ishii (L1, Japan), Yuki Takekawa (L2, Japan) and Takuya Masuyama (L2, Japan) whom I’m paired with today. There was an experiment for this GP where we were tasked to count decklists for validity even though it was made into something that we didn’t have to focus on a while back. While the Deck Checks team was primarily responsible for it and was supposed to coordinate it, judges who have nothing to do after the End of Round Procedure is wrapping up were sent to count lists. On checking Japanese decklists – knowing how to read Japanese is one thing, know what the cards names in Japanese are… took some getting used to. Fortunately, you get used to what Thoughtseize or Kitchen Finks is in Japanese after a couple of decks. 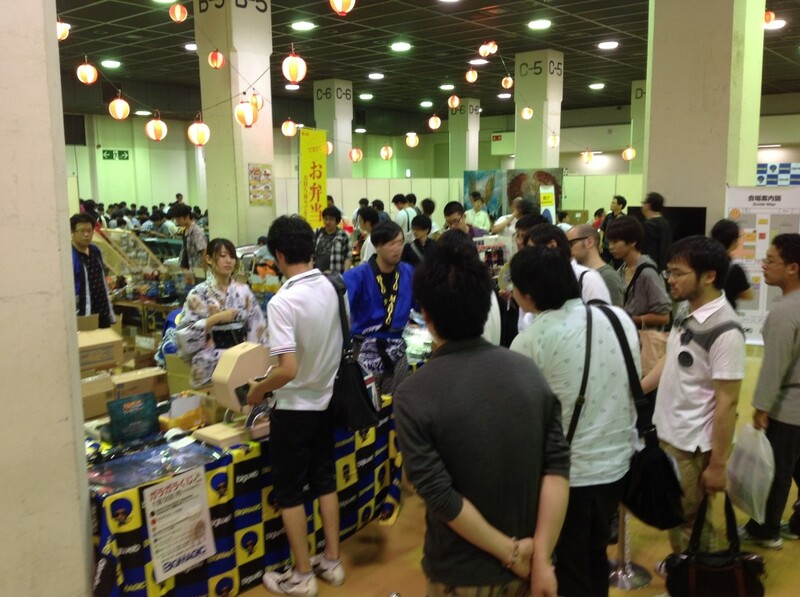 Another thing that came up on Saturday was how a player registered “Sea” (海) instead of “Island” (島) in his decklist. The team had a good laugh but everyone agreed it was likely an honest mistake. Suzuki, our TL wanted to have it downgraded to a Warning but Daniel Kitachewsky (L4, France) our red shirt for our side of the tournament told us to just give the player a friendly caution to be more careful in the future. Live coverage team hard at work. Felix is a really friendly Italian player whom I had to give a GL for registering 59 cards main. Thankfully for me, he took it rather well, and it turns out he’s here on his honeymoon with his wife and they are both playing – unfortunately they had to play each other one of the rounds. We did a targeted deck check on one of the players due to a 59 card main deck registered but turns out the other guy had not de-sideboarded properly. It didn’t felt like we took 17 minutes but I guess the delays added up pretty fast when I think about it. in hindsight, I definitely could have handled it much better. The moment we realize we are at a Double D/DLP scenario, it was already a pretty bad scenario for us to be in. I should have been alot more careful with the way we spent our time. Pulling the players to confirm the infraction and issue the penalty needed to be done in the shortest possible time. When in doubt, I should always consult but I was fairly confident in the scenario and D/DLP GLs are waived from needed a confirmation from a L3+ anyways. This could have saved us a few minutes. Then we have to have the player fix his Decklist as fast as possible, and I could have easily communicated this without a translator. Most should be able to understand the scenario (failure to desideboard) with me showing him his sideboard and his decklist. I could have saved more precious time from not having to find a translator and having him repeat what I said. The priority should have been getting the players back to their tables as soon as we can. Explanation about how they still need to play to two wins and no sideboarding can be done at the table and explanation to fellow judges not strictly necessary as we put priority on getting the games started and the fact we are confident of this scenario. Would you have handled the scenario differently? Do you have a better suggestion? Let me know! I’m eager to hear your comments regarding this. Twice today I suspected players cast spells without the right mana. Turned out there was an Urborg, Tomb of Yawgmoth in play and Blood Moon in another. Whoops. 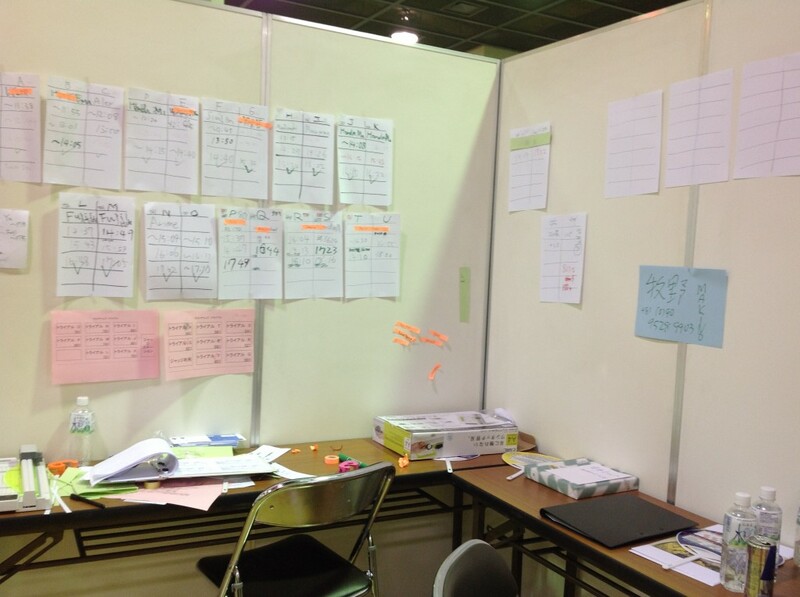 On Saturday, I worked almost entirely with just the Japanese language from my team and team lead. There were times where I had to clarify what my team mates and lead said but my Japanese listening skills are thankfully sufficient to understand most instructions and conversations the entire day. It was an interesting however mentally exhausting experience. To be frank, I was rather pleased with myself for managing that. I’m once again on Deck Checks, this time in the Main Event under our newly promoted L3, Joe Lau (L3, Hong Kong) with Naoaki Umesaki (L3, Japan) and Hajime Fujii (L2, Japan) whom I’m paired with today. This was my fourth GP but my first time working Main Event on Sunday. 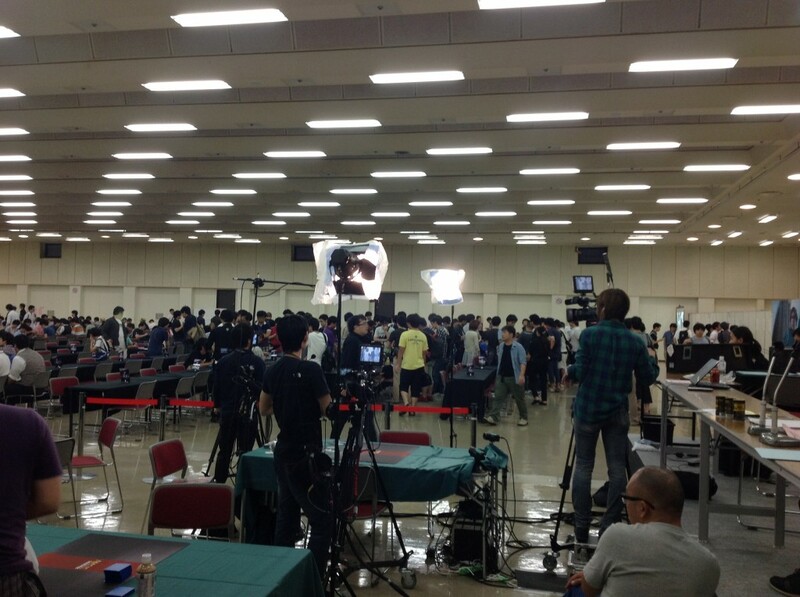 First order of things was to fetch out all the decklists for players in the main event from yesterday. We had to comb through two Day 1 tournaments’ standings to fetch said lists and made notes for missing lists. The issues that came up was how the players with sleep-in specials and late entries were in separate piles so it was rather troublesome to comb through all the lists they might be located at. Between checking decks and pulling lists, most of the time today was spent trying to find “missing” lists. Some ended up in Sleep In’s or other stacks, some had their first and last name swapped. Some we couldn’t find at all and had to resort to taking pictures of the decks through a deck check as a record. The rest of the day was rather uneventful and with that, another GP is in the books. Thank you for reading and please leave your comments and feedback here! Here are my collected judge calls or scenarios that I remembered to take notes for! Feel free to give it a try or comment on how I handled them! All names are fake and uses the A for active, N for non-active player naming convention. Q.1) You are covering the floor when you realized Alex played a Vendilion Clique, looked and chose a card from Nemo’s hand, and then that player Nemo puts that card into his graveyard. Nemo then continues to think before casting another spell. A.1) I paused the game immediately and pointed at the Clique and the card in the graveyard. The players realized the error immediately and a Warning for GPE-GRV was issued to both players. Notice how I did not have to use any Japanese to handle this call besides giving out the penalty. Also note that it is not a GPE-Failure to Maintain Game State for neither player since Nemo took an action called for by an effect controlled by Alex but did it incorrectly. Q.2) Amos cast Lightning Bolt on Neymar’s Tarmogoyf. There were only Sorcery and Land in all the graveyards. Does the Tarmogoyf die? A.2) This feels like a textbook Modern question. 🙂 Spells goes to the graveyard after resolution and you check for state based actions the next time a player gets priority. By this time the Tarmogoyf is a 3/4. Q.3) Adam wants to animate his Treetop Village after Norbert tapped all his creatures to tap all of Adam’s creatures with Glare of Subdual to stop Adam from attacking. Can Adam do that? The last chance Norbert has to stop Adam from attacking with his creatures is at the Beginning of Combat Step. It’s clear that Norbert has that intention, so we can assume that we have yet to enter the Declare Attaclers Step so Adam may activate his Treetop Village and attack if he wish to. 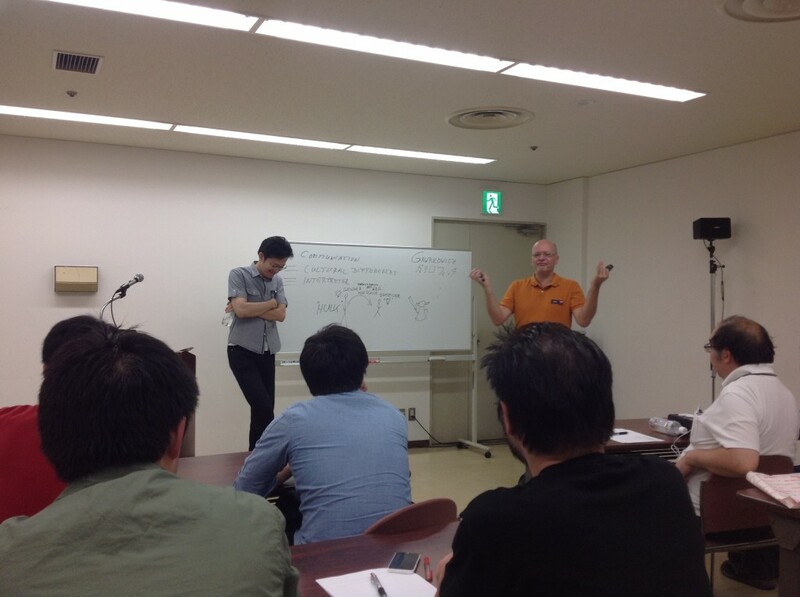 We interrupt the questions with a picture of Christian Gawrilowicz (L3) giving a seminar at the conference with Kenji Suzuki (L3) translating. A.5) I’m sorry there’s no such thing as a Japanese Oracle text. It’s only in English. A.8) No, Purphoros is still a creature spell on the stack irregardless of the amount of devotion you have. Questions, comments or did I make a mistake? Please leave your comments and feedback here! 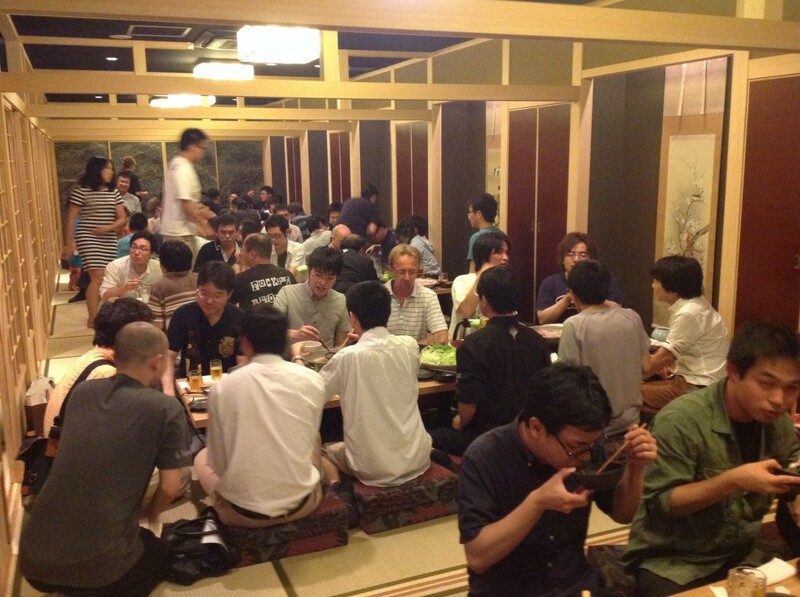 GP Kobe 2014 Judge dinner!